Early morning demo in pastel. Since 2011 Linda has held the official “Color and Energy” Workshop in the US, Italy and soon Greece. “Color & Energy” Session: basic and advanced color lessons to upgrade your color knowledge to create harmonious and exciting paintings whether realistic, impressionistic or abstract. All color has energy so learn how the colors you choose affect the viewer. Two or two and a half days working with Color in the studio. Learn to limit your value scale and simplify your block in of darks and lights by creating a small study. Translate the study into color after working with the color wheel and color exercises to better understand mixing, temperature and translating color to value. During a demo by Linda, learn to see the patterns of light and dark in order to capture the colors in light and shadow. Take the new knowledge you gathered from the workshop and paint a still life focusing on keeping your colors clean while capturing the light. Beginning at 10am, this segment is both in the studio and outdoors (weather permitting). * Review of the 6 steps to make a stronger painting before you start your painting and use the provided study book. * Add energy to your work by understanding color saturation's effect on our mood and energy. *How to capture trees with movement and volume. * Learn how skies reflect onto the leaves of trees and how to capture the growth of trees & the nuances in the change of temperature affecting the colors of the trunks. * Expand color confidence with a variety of exercises in a study book created by Linda included in the course. * Paint a still life set up (or from your own photo reference) to see the light and dark patterns for block in first in value and then color. Register TODAY to save $50. * Up to 60 days, the workshop is refundable less the PayPal charges. Up to 30 days prior to workshop, the workshop less 50%. Up to 14 days prior to the workshop, there is no refund for full payment unless you find another person to take your place. Your workshop is 100% refundable if you find a replacement person who pays in full and attends the workshop. Linda has been painting en plein air almost exclusively since 2002. As a Signature member of the International, NY and now California Plein Air Painters she is well equipped to teach you fundamental and advanced skills while outdoors. She came up with a way to create fast color studies that you will take out into the field to practice or use in the studio. Receive a free study booklet with the course and concentrate on making strong studies. Soon the dates for one day workshops will be available. Each workshop is limited to less than 9 participants. CHOOSE YOUR DATE & Register above. You will receive free sample products to use at the workshop from the companies sponsoring my events. These are the products Linda uses and loves the most. Learn to create a color study and then turn it into a work of art starting with prismatic colors. 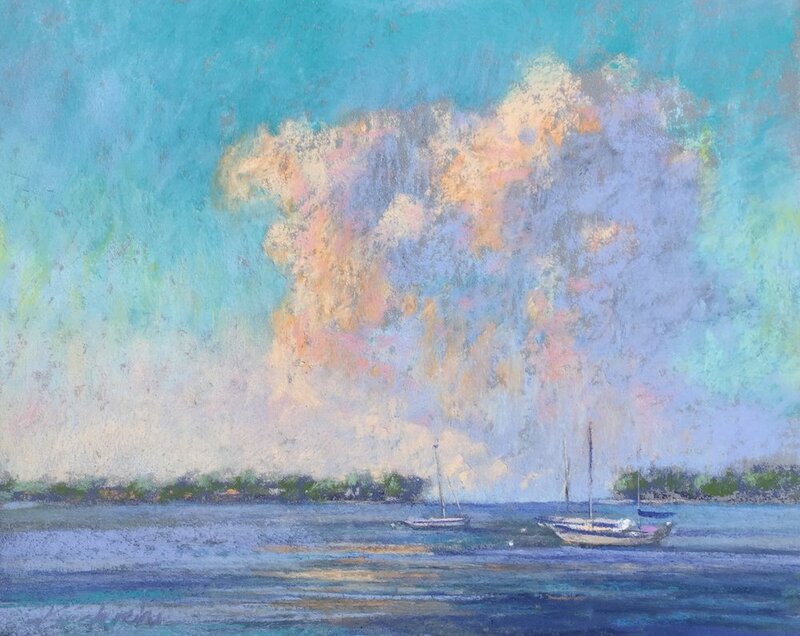 A fast demo created on the bay to show how to capture the light in pastel.